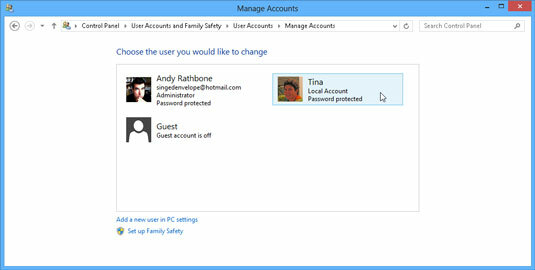 The Windows 8 Start screen’s PC Settings screen (its mini-control panel) lets you create a new account for a friend or family member. And it lets you tweak your own account, changing your password or switching between a Microsoft or a Local account. But if you want to change somebody else’s account, either tweaking its settings or deleting it entirely, you need the power of the desktop’s Control Panel. Right-click the screen’s bottom-left corner and choose Control Panel from the pop-up menu. From the desktop, slide your finger from the screen’s right edge inward, tap the Settings icon, and tap the words Control Panel at the Setting’s pane’s top edge. Click to open the Control Panel’s User Accounts and Family Safety category. The Manage Accounts window appears, listing all the accounts on your computer. While you’re here, feel free to turn on the Guest account by selecting its name and clicking the Turn On button. A Guest account provides a handy and safe way to let visitors use your computer — without giving them access to your files or letting them do anything that might harm your computer. Click the account you’d like to change. Change the Account Name: Here’s your chance to correct a misspelled name on an account. Or feel free to jazz up your account name, changing Jane to Crystal Powers. Create/Change a Password: Every account should have a password to keep out other users. Here’s your chance to add one or change the existing one. Set Up Family Safety: An Easter egg for parents, Family Safety lets you choose the hours that an account holder may access the PC, as well as limit the programs and games the account holder may run. Change the Account Type: Head here to promote a Standard user of high moral character to an Administrator account or bump a naughty administrator down to Standard. *Delete the Account: Don’t choose this setting hastily, because deleting somebody’s account also deletes all her files. If you do choose it, also choose the subsequent option that appears, Keep Files. That places all of that person’s files in a folder on your desktop for safekeeping. Manage Another Account: Save your current crop of changes and begin tweaking somebody else’s account. When you’re through, close the window by clicking the red X in its top-right corner. Any changes made to a user’s account take place immediately. Did this glimpse into modifying an existing user’s account in Windows 8 leave you longing for more information and insight about Microsoft’s personal computing operating system? You’re free to test drive any of the For Dummies eLearning courses. Pick your course (you may be interested in more from Windows 8), fill out a quick registration, and then give eLearning a spin with the Try It! button. You’ll be right on course for more trusted know how: The full version’s also available at Windows 8.